Don't forget to enter my giveaway for a four set of $5/$30 Enjoy the City Winn Dixie coupons before it ends at midnight TONIGHT! 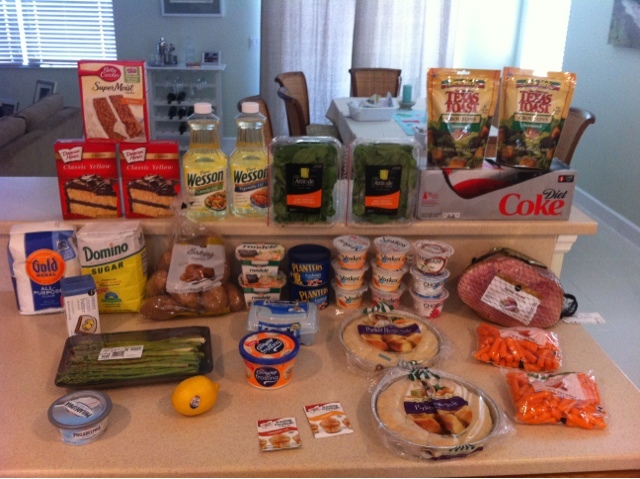 After over a week of not shopping, I hit Publix and Target today to get everything I needed for Easter dinner and Easter baking. I also grabbed some super deals and used a few expiring coupons too. Even though we have a boneless ham half in the freezer, we wanted a spiral ham for Sunday's dinner. So that ended up being almost 50% of my entire total. I also grabbed some baking basics since despite my stockpile of them, I always try to grab some when it's on sale. I am so excited to be making Something Swanky's Better Than Easter Carrot Cake this weekend so I grabbed a few random items for that too. Even though I spent over my normal $50, I was still very happy with my trip since I had so many fresh things and a $25 ham included in my totals. As always, I used two $5/$30 Winn Dixie coupons to help keep my totals low.